The Independent profiles Racing Post and outlines its new online payment system launched in July: 3,000 subscribers signed up in the first week, with membership now approaching ‘five figures’. This entry was posted in Editors' pick, Online Journalism and tagged business model, GBP, Independent, Independent.co.uk, live online racing, online, online payment model, online payment system, paid-for content, pay-for content, pence, racing post, racing uk, satellite subscription channel on September 21, 2009 by Judith Townend. Independent.co.uk will now stream radio broadcasts from Bauer in a syndication deal. A widget on the site will launch a radio player streaming KISS 100 and MAGIC 105.4. Earlier this month the BBC announced a free video-sharing deal with several UK national newspaper websites. This entry was posted in Broadcasting, Media releases, Newspapers and tagged Bauer Radio, BBC, Independent, Independent.co.uk, KISS 100, MAGIC 105, radio, radio player, United Kingdom on August 18, 2009 by Laura Oliver. “The rules which should have prevented online publication are governed by an outdated piece of legislation enacted at a time when Parliament could not have comprehended what a website might be, never mind know how one might work in the context of the criminal law,” writes the Independent’s law editor, Robert Verkaik. Verkaik is referring to the transgression of reporting restrictions, which banned the identification of Baby P’s mother and stepdad, by bloggers, online forum users and Facebook groups. The restrictions were officially lifted this week. This entry was posted in Editors' pick, Legal and tagged baby p, court reporting, criminal law, Facebook, High Court, Independent.co.uk, internet transgressors, law editor, mainstream media, online forum users, online publication, reporting restrictions, Robert Verkaik, the Independent on August 12, 2009 by Laura Oliver. Yesterday afternoon in a powerful Guardian exclusive, investigative journalist Nick Davies reported that the Murdoch News Group papers paid £1m to ‘gag’ phone-hacking victims. Rupert Murdoch, who owns News Group, recently argued he had little influence on his publications’ editorial content; it would be interesting to see how his other UK papers would treat the story about their sister title today. Note: Observations correct at time of writing; subject to updates. The BBC has headlined many of its bulletins across radio and TV with the story. Channel 4 ran with the story yesterday. 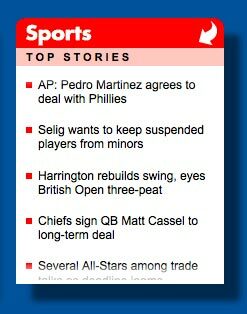 Both news sites feature the story as the main article. Sky News (M) ran it last night and its main (breaking) story on its website is “Cameron: ‘Coulson’s Job Is Safe'”. This entry was posted in Editors' pick, Legal, Online Journalism and tagged aide, Andy Coulson, Australasia, BBC, British Tabloids Face Scrutiny By Government on Privacy Issues, clive goodman, Daily Mail, DailyStar.co.uk, Dow Jones Co., Europe, Express.co.uk, Financial Times, GBP, guardian, Independent.co.uk, investigative journalist, London, Mirror.co.uk, Murdoch News Group, News Corp, News Group, News International, News of the World, NewsoftheWorld.co.uk, Nick Davies, phone hacking, Rupert Murdoch, Sky News, Sun.co.uk, Sunday Times, Telegraph Fiji Times, Telegraph.co.uk, the UK news, United Kingdom, Wall Street Journal on July 9, 2009 by Judith Townend. Good summary of the key issues using DebateGraph – the map draws on arguments from Jeff Jarvis, Roy Greenslade and Gavin O’Reilly amongst others. Some links to some prominent reports/blog posts/comment pieces expressing these arguments would be a great addition. You can rate the arguments made and add new points after registering. As users rank ideas, the strongest and weakest arguments will be shown by the size of the arrows connecting them. This entry was posted in Editors' pick, Newspapers and tagged Gavin O'Reilly, Independent, Independent.co.uk, Jeff Jarvis, Roy Greenslade on July 6, 2009 by Laura Oliver. 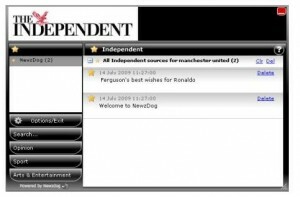 A ‘new toy’ (the words of editorial director for digital Jimmy Leach) from the Independent – an iGoogle widget that displays the title’s latest news, business and sports headlines. The widget allows you to customise your iGoogle homepage – other news widgets from the BBC and CNN, for example, are already available. “We’ve worked closely with Google to put this together and it will be a fantastically useful source of news and opinion for Google users now and in the future,” said Leach on Independent.co.uk. This entry was posted in Social media and blogging and tagged BBC, CNN, editorial director, google, iGoogle, Independent.co.uk, Jimmy Leach, widget on June 3, 2009 by Laura Oliver.